Thermal effects and mechanical instabilities in the microscope can cause the sample to drift under the electron beam. Since the acquisition of a spectrum image (SI) can occur over a considerable period of time, this drift could easily cause features to be smeared in the SI. Indeed, SI acquired over a long time at high magnification may contain data from a much different region of the sample than desired. Spatial drift is worse at higher magnifications and will vary from one microscope to another and even from one microscope session to another. Spatial drift correction entails a cross-correlation of a reference region with a new scan of the same region taken periodically throughout the acquisition of the SI. The cross-correlation process will work better if there is some unique spatial structure in this spatial drift region. First, a reference scan of a user-defined region is obtained from the survey image. At the start of the SI acquisition, the first drift measurement scan is taken from the same region and any spatial drift is corrected. The scan resolution and pixel dwell time used for the spatial drift scans are the same as for the survey image. Drift is measured by cross-correlation, thus the correction is applied as an offset to the beam scan coordinates. 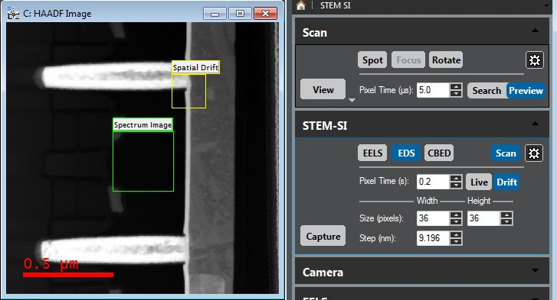 When a measurement is performed, the result is posted to the DigitalMicrograph® Results window, with any shift quoted in calibrated units if the survey image is calibrated also. During acquisition, the drift measurement is then repeated periodically using the specified frequency. Once acquisition is completed, you can view the drift measurement using the Show correction menu item in the SI menu. Note: Since the drift image is acquired during the SI acquisition, the detector must not interfere with the spectrum acquisition when inserted. Ensure a survey image has been acquired and assigned for the SI acquisition. Enable the Drift button on the STEM-SI palette. A rectangular ROI marker labeled Spatial Drift will be shown on the survey image, indicating the measurement area for drift correction. Adjust and accept the correction frequency settings. The optimum frequency of corrections will depending on the magnitude of the drift. It is a compromise between keeping the total acquisition time short and getting clean SI data. When you choose a drift correction frequency based on spatial features (pixels, rows, frames), this will generally give a more pleasing result than the time based settings. Adjust the Spatial Drift ROI. Use the mouse to resize and move the ROI to an appropriated location. The measurement area should be at least twice as big as the maximum drift expected in between two subsequent measurements. It should contain an easily recognizable feature of sufficient contrast. Ideally, the area should not overlap with the data acquisition area. Adjust the advanced drift correction options (if needed). Click the Drift button while keeping the Alt key pressed to directly access the drift correction options page of the Spectrum Imaging Setup dialog. When configuring the various spectrometers for SI acquisition (e.g., determine the optimum pixel dwell time for acquisition), it is often desirable to acquire a continuous spectrum from a region in the Survey Image. The microscope beam can be placed anywhere within the survey image using the Spot functionality so you can view the spectrum from each spectrometer at that position. Acquire and assign a Survey image. Enable the Spot button the Scan palette. A cursor labeled Beam will appear on the survey image. If the survey image is currently acquiring, the marker is labeled Park instead. In this case, stop the acquisition to get a stationary beam. Start a continuous acquisition from the spectrometer(s) of interest using the View button of the respective Spectral Acquisition palette – The spectrum acquisition will appear in a new line plot image display. Drag the beam cursor around to view the spectrum at various points. The spectrum display continues to display data from the spectrometer as the spot marker tool is dragged around. Use this mode to establish the optimal acquisition parameters for SI acquisition. When the acquisition is paused, or has finished, an attempt is made to minimize possible beam damage to the specimen. The beam is either moved to the park point (if you have defined one) or the beam control is returned to the microscope. Note: The point is labeled Park during an active scan. This label name changes to Beam while no scan is active and the beam is stationary at the indicated location. Ensure a survey image is assigned. 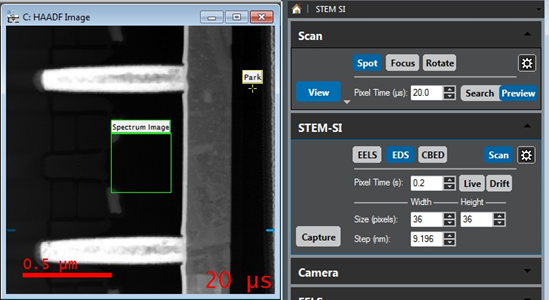 Enable spot mode on the Scan palette, and position the Beam cursor at the safe point – A region in the vacuum is ideal. If the SI acquisition is paused, or when the acquisition terminates, the beam will be returned to this point.